Pasty Central has become a primary starting point for many Upper Michigan visitors. As a service to our guests, bi-weekly we highlight another interesting U.P. destination to browse. "The Golden Pasty Award" is bestowed on each of these sites to recognize technical excellence and quality content relating to the Great Lakes region. 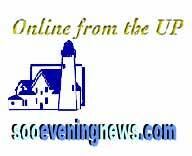 The quality online news source of the eastern U.P. Golden Pasty Hall of Fame.